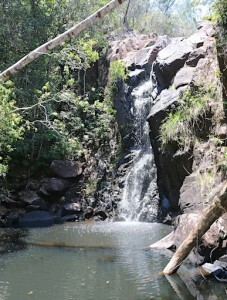 Paluma is the default trip destination in hot weather. This time we chose a walk we were unfamiliar with, to Ethel Creek Falls, and chose the easiest way to get there, from Hussey Road. A couple of members decided to camp overnight at the dam hoping for some wildlife sightings but micro- and megabats seemed the only animals out on a Saturday night. A quick stop at Birthday Creek Falls next morning to see if the Tooth-billed Bowerbird was still performing at the edge of the car park turned into a long stop because a Satin Bowerbird apparently had taken over that group of trees and was calling loudly, oblivious of people creeping around him with cameras and now running late to meet the rest of the group at the start of the track on Hussey Rd. 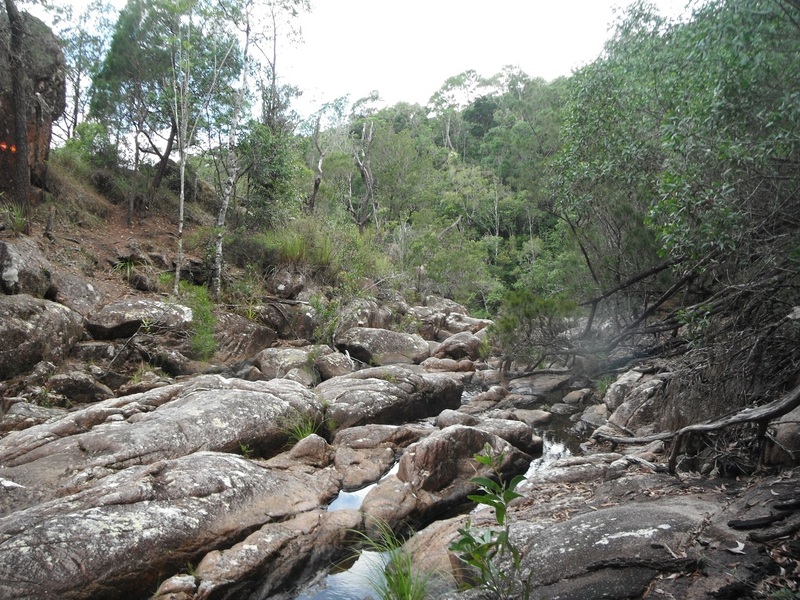 A dozen people set off down a narrow but easy track which was mainly shady, and in 30 or 40 minutes had all arrived at Ethel Creek which had little water in it though still flowing. 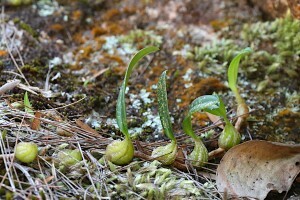 Small orchids grew on rocks beside the water. The plantos peered at leaves and debated identifications. Some others walked a little way upstream to a deeper pool and just stayed there, and were still semi-submerged when most people left an hour or so later. Everyone did a little exploring. To get to the falls it was necessary to cross the creek and go steeply downstream. Whoever had opened up this track to Ethel Creek had also installed a heavy-duty rope to hold, making it a much safer walk and making the falls accessible for the less athletic. As usual in rainforest we had heard more birds than we managed to see. 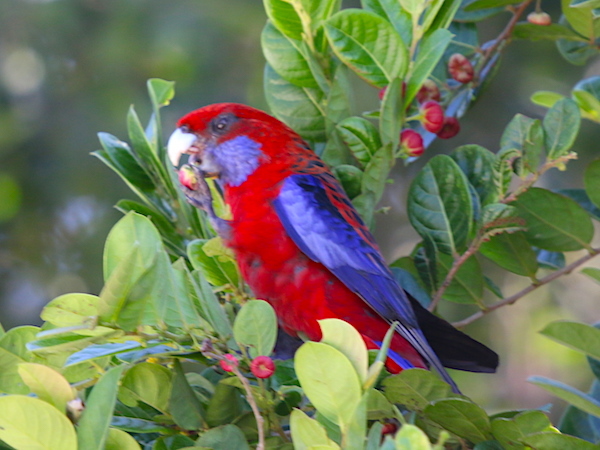 These included Spotted Catbird, male Victoria’s Riflebird, Grey-headed Robin and the ubiquitous Sulphur-crested Cockatoo, but Malcolm photographed a Crimson Rosella in a Glochidion tree on the Village Green. We wandered back to where the cars were parked and set up chairs on the mown grass in the shade of big pine trees beside private property and had lunch. Off to the other side among the wattles and other natives, occasional pine trees stuck out. Apparently before Cyclone Yasi there had been a pine plantation there, and these were survivors. That was the last outing for 2018. The first walk next year will be in February when the worst heat is over, ha. Thank you to Malcolm for use of his photos.